Hankuma's art is crude and evocative and funny in and of itself, something you might see from an artist angry that his well-rendered work didn't sell and so he's set out to create an entire comic for his own benefit while sitting in the garage high on rubber cement. I could have 200 more pages. I saw Tom at comicon and I was the one who told him about TZ. Dang then, nice work my friend :) We can't thank you enough for all the great support you've given! gotta get me a copy!!!!! gonna do it!!! 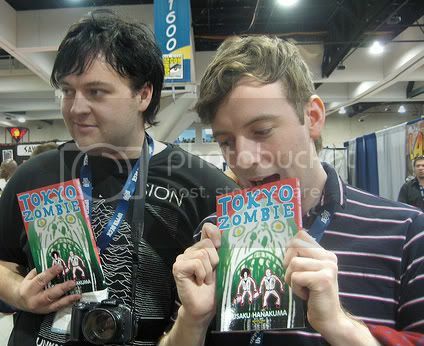 I picked up 'Tokyo Zombie' the other week and read it... awesome! Thanks for releasing such an awesome title!!! just saw the movie, i liked it a lot, now i gotta read this, guys.